Ritual Origin Velocity 55 Hockey Stick (2018/19). THE PERFECT CURVE FOR ADVANCED SKILLS. The elite-designed Velocity stick shape is now available at a more affordable price in the Velocity 55. The perfect curve profile for advanced skills with a 24mm bow and 55-degree maxi head shape. With excellent drag flicking capabilities, the Velocity 55 also includes a silica face and imported Super Soft grip. Combining the latest developments, features, and mould shape to make the perfect stick for dynamic players seeking a state-of-the-art edge to their game at an affordable price-point. ORDER BY 2PM (MON-FRI) AND WE WILL DISPATCH THE SAME DAY. We are authorised stockists of all the leading brands. Order by 2pm (Monday - Friday) and we will dispatch your order the same day. 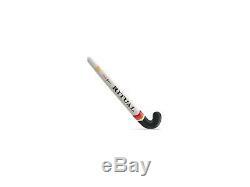 The item "Ritual Origin Velocity 55 Hockey Stick (2018/19), Free, Fast Shipping" is in sale since Wednesday, July 4, 2018.